ToCA Race Driver 3 lets you race in virtually every professional racing circuit in the history of the sport with unrivaled vehicular and course accuracy. Want to race in the Daytona 500? No problem. How about the World Sprint Car series? Sure. How about driving a Mercedes-Benz W25 in a 1930s-style European racing circuit? Yes, and much more. In the game’s World Tour mode, you start off with a select few race courses and championships. As you complete each championship’s objectives (usually finishing in the top four), you unlock another tier of racing courses and championships. There are over thirty tiers in the game and each one unlocks on average three new championship series. Expect to invest many hours to unlock the later tiers. Aside from racing, you can personalize your car in each race. The tuning tab allows you to control downforce, transmission, anti-roll, ride height, brake bias, tires, suspension and toe and camber. It would be nice if the game had a tutorial on how to properly calibrate these functions, because each car handles differently and some are outright impossible to control when you first test them out. Yet, each car is set on default settings for what a realistic drive would be like with the selected car. Every car drives differently; stock cars are top heavy, Formula 1 racers have a tendency to spin-out, monster trucks bounce around a lot. This means that each new championship series requires a steep learning curve as you initially crash the car numerous times on that first turn. Racing fans will enjoy the challenge but casual gamers will find the unforgiving controls frustrating. Thankfully, restarting a race is only a click away and if you screw up badly on the third race of a series, you can simply restart the current course and don’t have to start over from the beginning of the series. Still, budget about an hour to get used to the controls and the handling of your first car. I also recommend switching your gearbox to manual settings for better control. In World Tour mode, you are introduced to your mumbling Scottish crew chief and mentor, Rick. Rick is unfortunately the most attractive human in this game, as the pinup girls you see around the cars all have faces that look like deflated basketballs. It’s a shame the graphics aren’t more spectacular. Using a MacBook Pro 2.4GHz Intel Core Duo and its Nvidia GeForce 9600M GT video card, the game still skimped on details around the edges and didn’t impress with its rendering of light, shadows, or backgrounds. The damage animation is predictable and scripted, but damage does thankfully correlate with the speed of your car. Gauges will indicate what’s been damaged (tires, suspension, etc) and Rick will scream at you to take a pitstop and repair the car. This will cost you valuable seconds though, so you’ll have to make some executive decisions in the game like a pro driver would. ToCA Race Driver 3 trades style for accuracy and many will gladly accept the trade. Race through old England, jump around a dirt course and see some of Australia’s finest ovals-everything here looks pretty true to life. When you put your cursor over a potential race, you see clips of the race in the background. This is especially stirring when you enter one of the old 1930s races. Seeing the Renault A110 International rally’s old black-and-white footage really makes you appreciate this is a game made by racing fans. Pro Career mode allows you to play the races you’ve unlocked in the World Tour section, and Simulation Mode allows you basic drives and the like. 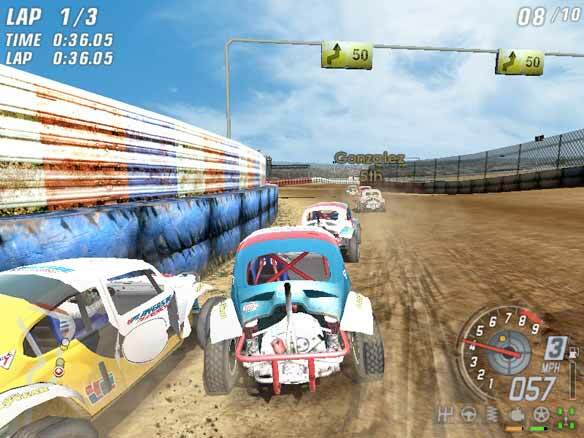 ToCA Race Driver offers both split-screen multiplayer and online connections through a network or finding a server through the GameRanger service. Deep and varied races make ToCA Race Driver 3 a compelling game for any fan of racing. While it’s a pain to have to race in a championship series you don’t care about in order to unlock ones you do, it’s what makes the game challenging and its fun to see Rick’s commentary as you progress as a driver. The graphics were probably top of the line in 2004, but now the courses look positively retro. If you’re a racing fan and want to broad selection of customizable and unique cars throughout the sport’s history, you could be very happy with TOCA Race Driver 3. If you’re just looking for a stylish adrenaline rush with cool cinematics and beautiful cars, this probably isn’t the game for you.